Hobbies: Gardening and growing my own food, horseback riding (haven't had horses for a few years though), and cooking down to earth but fantastic food. Pet peeves: Oh, I hate lazy people. And people that don't have a lick of common sense—I would call them stupid. Momma always said to use your noodle—God gave it to you for a reason. Boring and dull pisses me off too. Oh and whiners—I can't stand whining! Being a mom. I pushed two girls out with no pain meds. I was a beast! Also, winning three state championships in Kentucky 4-H with my poor horses. Developing and managing the most successful program at Redcloud, "JAW," which was an intense discipleship program for high schoolers, to teach work ethic, service, Bible, and riding instructing skills. My brother Josh. He is in the U.S. military. Everything he does is out of love and pride for our country and the people in it. He loves and adores his family and is fiercely loyal to his faith and God. We were best friends growing up and we talked about everything. As we each have our own families now, we don't talk as much, but I love him more than ever. And I literally think of him anytime I am going through a struggle and I remember to keep pushing and don't quit! My hat. I feel naked without my hat. Like I would wear my genuine wool lined raccoon hat to church when I was 11. My mom would sometimes try to get me to take it off, but it ended in a blow up fight. I wore my hat during labor and delivery for my two daughters, and also during my surgical C section with my son. I sure had to convince the surgeon to allow my hat in that operating room. And chocolate. Every girl who has ever had a period needs chocolate. It's also good for sad, or happy, or mad, or hungry. Finally, a notebook and a pencil. So I could keep track of my thoughts and plans better. Especially without someone to bounce ideas off of—I would not want to forget something obvious. Big Tom from Africa. He was a redneck, funny, knows more about farming than current culture. 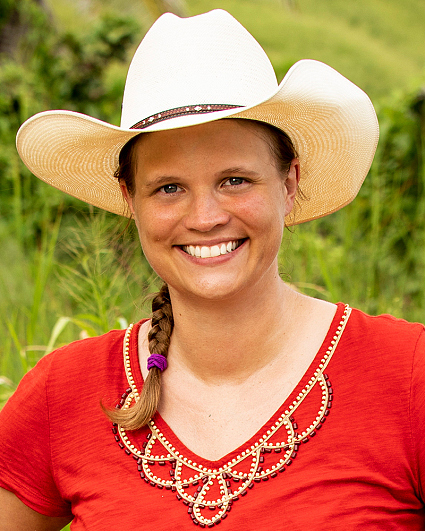 Also, Sandra Diaz-Twine, who was passionate, smart, played the game hard, and objective. Being true to who I am and pursuing my dreams. No matter how crazy. It's not crazy if it's something you want to do. I can't stand the idea of living with regrets. I want to LIVE my life. The craziest/stupidest thing someone could do would be to love cautiously and in fear. Pursue your dream, who knows it may come true. I can win! Like I believe I will win, if I get to hear Jeff say the words, "Welcome to Survivor, here are your buffs." I watched my first episode during Australia and loved it. Even as a kid, I knew I was made for this show. And that I could win and make all of us southerners proud! I will be liked and needed by all especially at the beginning, the provider role. I will develop relationships with unlikely people and help bring cultures and ages together. I will be competitive in challenges. I am strong and don't quit. I didn't quit through my season of depression. Just kept putting one foot in front of the other. Didn't rely on feelings, but logic. I defend people and injustices. People talk to me because I am trustworthy. I have watched enough of the game to know how it is played, but not so fanatic about it that I am a geek. I just LOVE the show. I love strategy and don't mind cutting ties if it benefits me, even if it is hard. I have moved all over the planet and it all worked out.